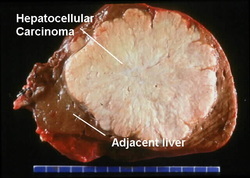 Hepatocellular carcinoma is the commonest carcinoma of the liver. The other variants of hepatic carcinoma include cholangiocarcinoma, hepatic adenomas and hepatic angiosarcomas. Cholangiocarcinoma is a bile duct carcinoma. Cholangiocarcinoma is associated with infestation of Clonorchis sinensis. Cholangiocarcinoma is common in the far east. Hepatic angiosarcomas are associated with exposure to the thorotrast/polyvinyl chloride while hepatic adenomas are associated with oral contraceptive intake which may lead to intraperitoneal hemorrhage. Hepatocellular carcinoma mostly present as sheets or cords of cells which resemble the hepatic parenchyma to the anaplastic masses. The tumor is green tinted and pale in color. Hepatocellular carcinoma may appear as a single mass, multiple masses and infiltrative types. The masses may infiltrate the inferior vena cave or portal vein. Hepatocellular carcinoma may spread to the adrenals, lungs, vertebrae and brains via hematogenous dissemination. Hepatocellular carcinoma is treated with liver transplantation ( in severe cases) or surgical resection, radiotherapy and chemotherapy. The common causes of hepatocellular carcinoma are hepatitis B virus infection, hepatitis C virus infection, hepatic carcinogen ( aflatoxin B1), Wilson’s disease, alcoholic cirrhosis, hemochromatosis, alpha 1 antitrypsin deficiency. Patient with hepatocellular carcinoma may present with signs and symptoms such as cirrhotic symptoms, bloody ascites, hepatomegaly loss of weight and fever. Death may occur 10 months after being diagnosed with hepatocellular carcinoma. Liver enzyme may be elevated such as ALP and alpha feta protein may also elevated. Alpha feta protein is a tumor maker for hepatocellular carcinoma detection. Blood count may reveal leukocytosis and anemia. 1.Rolfes, Donald B. “Hepatocellular Carcinoma: Pathology.” In Current Perspectives in Hepatology, edited by Leonard B. Seeff M.D and James H. Lewis M. D., F. A. C. P. F.A.C.G, 419–426. Springer US, 1989. 2.Bruix, Jordi, and Morris Sherman. “Management of Hepatocellular Carcinoma.” Hepatology 42, no. 5 (2005): 1208–1236. doi:10.1002/hep.20933.